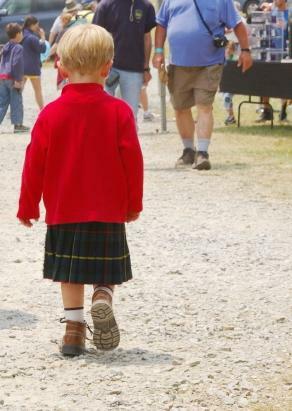 Boys in Kilts, how cute would your son look in one? Nowadays you can see more and more boys in kilts, as more and more parents become aware of the benefits of dressing their little darlings in a boys kilt, for all sorts of special occasions. Probably the most common place to see a boys kilt, is at a wedding one reason being that the groom and groomsmen are in full Highland Dress, so it is fitting that many of the younger guests also wear the kilt. Below you can see a video of a little boy who is supposed to have his photo taken with the Bride, but is far to busy enjoying himself dancing. And on the video you can see just how cute little boys look in kilts, and how much fun they have wearing them. It is even possible to dress your baby in a kilt, as baby kilts are now available to fit children as young as three months old. Below you can see a photo which shows how cute boys in kilts look, and why many parents are choosing to dress their sons (and often daughters) in kilts. The photo also shows that kilts are not just for dressing your little boys up for special occasions such as weddings, but are very practical for casual wear also. Many schools use kilts as their school uniform, as they are both practical and hard wearing,. In fact a good kilt will last a child several years, as the hem can be taken down as the child grows, can you imagine a pair of school trousers lasting more than one school year? The boy scout movement have used kilts as their dress uniform for many decades, and they too find boy kilts both practical and extremely smart as a dress uniform. You can even find a budding young Scottish entertainer performing as a kilt boy, just have a look at the next video to see how dashing a boy looks in his kilt outfit. so why not dress your little man in a kilt, and be amazed at all the positive reactions and comments he receives while wearing it. If you would like any help deciding on the right kilt for your son, or where best to buy one, then drop me a line using the contact us page, and I will be delighted to help.